If you are looking for fun and exciting game to play it on your iPhone, iPod or iPad, Aggro Cubes is an excellent brand new concept with HD graphics, so many levels and graphical feel and menus system as in famous Angry Birds. 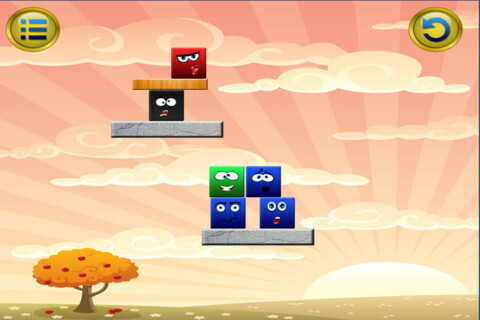 The idea of Aggro Cubes game is to succeed in making the red colored cubes fall from the platform by moving and manipulating cubes in other colors. Aggro Cubes starts off with training levels to explain you how to play the game and what are the rules you should follow. The rules are simple and everybody can understand them, but your success is only up to you! So, what can you do with other cubes? Black cubes can be exploded in order to move other cubes with some force. White cubes are expandable and therefore very interesting to be used. You can pop blue cubes and this way you can allow other cubes to move and fall into the new empty space where the blue cube used to be. You should not let green cubes fall from the platform, because if that happens your level is failed. As you can see, the rules are quite simple and the game costs only $0.99 and it provides you so much fun, levels, contents and of course the great challenges. Aggro Cubes is fast and fun puzzle/strategy game, very addictive and exciting. You can buy and download this app here: https://itunes.apple.com/us/app/aggro-cubes/id575157979?mt=8.